This article and video entertains you with a Los Angeles story about surprising impact damage on 19th century paintings of high society fashion with some tips on condition from an art conservator. 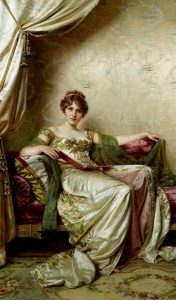 See several paintings of gorgeous women in The Gilded Age Society, paintings by the French-Italian Master Artist Frederic Soulacroix. This short video about a painting of a pretty lady in a gorgeous pink dress during the Gilded Age Society and the reason she was in our lab will surprise you! But it was the freak accident that occurred… which happened to TWO paintings, unrelated, of gorgeous ladies in pink dresses… that surprised US! The freak accident is a good story with an educational slant for you art collectors out there. Art collecting is all about due diligence to make sure the quality of what you are buying is what you think it is. The video includes several tips on identifying condition issues, which might influence the value. Let me tell you quickly the story of the celebration with popping corks that put a hole in our young lady in a pink dress. How often does THAT happen?!? !… but to the surprise of the art collector, when he came to our lab to discuss the repair, we already had another painting of a lady in a pink dress with the same damage! Take note when you are inspecting closely paintings that have some age, you will often see a cracking pattern that looks like a spider web or bulls eye. In the middle is where the painting took a hit, a point of impact… like a speeding cork! But the damage can be done in a myriad of different ways. Did you know that the inpainting (retouching) to repair lost paint appears as a purple blotch when seen with a UV light? Soulacroix was born to well-known fresco painters and sculptors, Charles Soulacroix and Giacinta Diofebo. By the age of 15 years, in 1873, Frédéric entered the Accademia di Belle Arti of Florence, and, in October 1876, he was admitted to its School of Painting. He remained in Florence for many years painting often romantic genre pieces in costume of the 18th or early 19th centuries. He hit his stride, so to speak, during The Gilded Age in high society of the early 20thcentury. His works can be seen at the Museum of Arts of Philadelphia and at the Lord Mayor collection Mansion House in London. Call us for a pleasant chat about your art restoration questions: 805 564 3438 Scott M. Haskins, Oriana Montemurro, Virginia Panizzon Art Conservators. This entry was posted in In Lab, Painting on canvas and tagged painting restoration. Bookmark the permalink. They do painting restoration work that consists 80% of redoing other people’s screwed up jobs. I just gave him a $50k painting this week with problems from the recent past. We live in Whittier. It was time well spent to meet and discuss our collection needs. I’ll discuss with the board. Thanks again. It was so wonderful spending time with you and Diana!! Thank you again for coming and spending time .Thank you also for a great lunch. It was delicious! The picture you worked on is beautiful. FACL’s work and reputation are without reproach. Good folks to work with. Loved talking with Gena!! Danielle at FACL helped me with framing questions I had when I called with the painting restoration question. I got great info that seems to me to be accurate and trustworthy. So we’ve followed through and are looking forward to a visit by FACL to pick up our artwork. I called FACL and had a good, informative conversation about my questions with an art conservator. Then, Scott came to our house in West Hollywood. We had an excellent visit and our painting restoration work is being done now. Wow! I really liked the way they did business and took care of us. I love these guy’s work so much. When Scott is in the area (weekly) I’ll drive to meet him wherever he is. I go around and find deals at garage sales and for the repair of anything nice, I call FACL. Scott is a source of knowledge and learning for me that is amazing. We live in Monterey Park and after working with two other people local to our area, we feel “saved” now that we are in FACL’s capable hands. The other highly recommended person was a joke! A fireman but his boot right in the middle of a wet artwork that I cherish when we had a house fire (but they are my heroes for saving the house!). Andrew worked with the insurance company and the disaster response company and made it easy for us… The restoration work turned out perfect. I called FACL after checking quite a bit on different internet sites and they are known far and wide. Andrew came to my house in Long Beach to pick up our artwork. The door to door service is really helpful. So far, I’m really pleased.